Just miles from picturesque Lake Oconee, where the successful enjoy their comfortable second homes, this man is in the Butterflies & Blooms Briar Patch Habitat, in sweet Eatonton, Georgia. He’s there to find and photograph butterflies, especially butterflies native to the southeastern United States. It’s about 10:10 A.M. and those tiny Swallowtail caterpillars are his instant targets. His film camera is this Canon Elan 7e with a Cannon Macro- 100mm/2.8 lens. The hat boosts Archangel Ancient Tree Archive. The headband, now having travelled more than 28,000 miles is from Dicks. The green shirt is worn to reduce the perceived threat as I approach butterflies, and from LL Bean. The jeans from Wrangler. The boots from Merrell (they did just great! in ’15 and ’16 on Israel’s uber-rocky terrain). The wool socks from . . . Goldtoe ( and a connection to . . .). Now, the enthusiasm? That’s from just being able to do this, having survived all of those precarious parts of my life, the sheer joy of meeting exquisite beauty, the real desire to be an esthete and a great appreciation for the Almighty, for allowing me to experience all of the above. There are very few places in the 50 states of the United States that have this potential. What potential? I have seen 29 different species of butterfly at this Habitat in 2017, in a single morning. Virginia’s regulars and irregulars have pushed, pulled & planted a butterfly destination unlike almost any other . . . in America, right here in Eatonton. I’m trying to remember who to credit this photo to. I think to that very same Virginia C Linch. How Many Are So Blessed? The News each day now is riveting. As crucial as it is that we Americans enjoy life, liberty and the pursuit of happiness . . . the journey to that Oasis is often long, and tenuous. So, this very morning as I decide which images to share with you in Golden, Ontario, Madison, Mishmarot, Sao Paolo, this sweet one jumped, yep, jumped out at me. That’s Mike’s righthand, raising and holding this Passionflower vine. We are a hike from his home in Kathleen, Georgia (Oh that name! ), and we were right at the home base of a small squadron of Zebra Heliconian butterflies. Southern butterflies that just thrill! as they fly effortlessly, it seems, amongst thickly vined passionflowers. Just a short time ago, in another blog, we noted that this unlikely brood of Zebra heliconians flies several hours north of their general range. That knowledge made this day sweeter yet! Of course the now legendary Virginia C Linch arranged this day for me, and she is just about the Ryan/Brady equivalent of a Georgia butterfly booster. Then, what are these little bits of slow-moving jewelry? Zebra heliconian caterpillars. Forgive my repeating myself, but Kudos to the D-signer. Just as quickly as I just opened this image of a Monarch Butterfly caterpillar, the Little Boy in me showed up, summoned by the Mystery of this phenomenon. At the Butterflies & Blooms Briar Patch Habitat, in Eatonton, Georgia. We have photos in my archival photo albums, of Jeff as a boy, in Brooklyn, at the beach at Rockaway Beach, Queens, New York and at the other side of that Peninsula, at the water’s edge of the bay. I have photos of Jeff on Grand Bahama Island, turning over rocks, searching for living things. That has long been a family giggle, Jeff, Dad, examine, searching, following, studying living things, usually bent over, crouching. This Danaus plexippus caterpillar just mesmerizes me. The color, the body plan, those true and false legs, its slow, plodding movement, that slower, carefree feeding. How it’s goes through instars, how it seemed too big to exit from its tiny egg. I grew up in Brooklyn, on the streets, and it took several years, when I moved to Pittsburgh, for me to lessen the need to always know who was behind me . 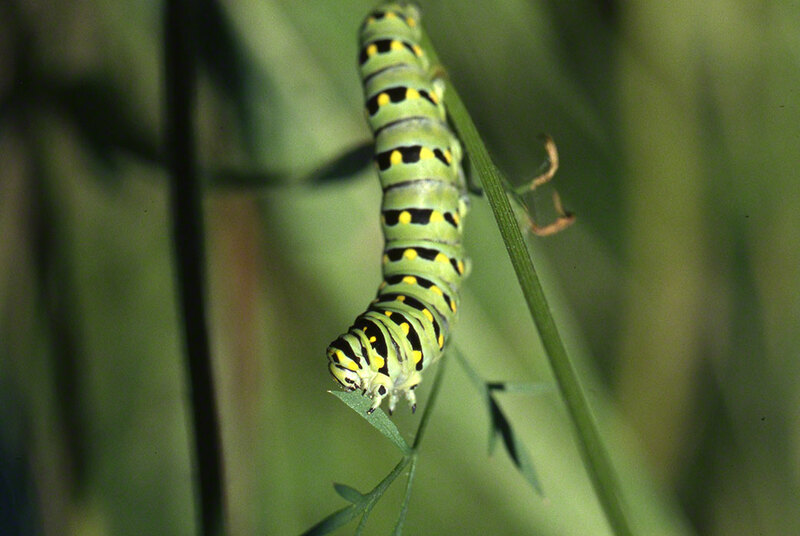 . . and this larva packs its own defenses, without need to carry cold steel just in case. How with so many predators in its neighborhood, it has reached this level of success? I’m telling you, this image just summons the Little Boy in me. Forget the image of me you’ve seen, that Little Boy is just . . . .